Amardeep Singh's SharePoint Blog: Outlook continuously prompting for password while connecting to Office 365? Solution is here. A Blog about SharePoint knowledge. Here you can find most information related to SharePoint Administration, SharePoint Development, My experience with SharePoint client, Information on SharePoint server and End user computing, SharePoint Study Materials etc. HAPPY Reading...! Issue: Outlook continuously prompting for password while connecting to Office 365 Find out the solution. Error: The connection to Microsoft Exchange is unavailable. Outlook must be online or connected to complete this action. Change the Logon network security setting to Anonymous Authentication. If you can’t find “Anonymous Authentication” under Logon network security drop down, you will have to download Service Pack 2 , which is mandatory for Outlook 2010. Open attached PDF to download the Service Pack 2. Swipe in from the right to open the charms, tap or click Search , and then type control panel in the search box. Or, type control panel at the Start screen. Click Start, type Control Panel in the Start Search box, and then press Enter. 3. In Control Panel, locate and double-click Mail. 4. Click Show Profiles, select your Outlook profile, and click Properties. 5. Click E-mail Accounts, select Account Settings and on the E-mail tab, click Change. 6. In the Change Account dialog, click More Settings. 7. In the Microsoft Exchange dialog, select the Security tab. 8. From the Login network security dropdown, select Anonymous Authentication and click OK.
9. Click Next and click Finish, and then click Close on the Account Settings dialog. 10. Click Close on the Mail Setup dialog, and click OK to close the Mail control panel. 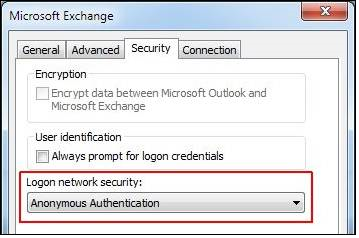 This issue can occur if Logon network security under More Settings on the Microsoft Exchange Security tab is set to a value other than Anonymous Authentication. Applies to: Outlook 2013, Office 365. Labels: Outlook continuously prompting for password while connecting to Office 365? Find out the solution; Outlook continuously prompting for password while connecting to Office 365? Solution is here. Microsoft Virtual Labs SharePoint 2010. 'Edit Document' requires a Windows SharePoint Services-compatible application and Microsoft Internet Explorer 5.0 or greater. We can't sync this section because you don't have write permissions: OneNote. All copyrights are reserved to MOSS and WSS. @ 2008. Simple theme. Powered by Blogger.